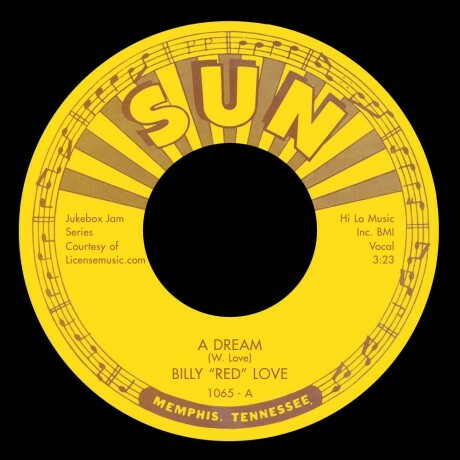 BILLY RED LOVE "A Dream / Hey Now" 7"
Two originally unissued recordings from the Sun studios released here on 45 for the first time. Little known pianist and singer Billy 'Red' Love recorded the jazzy, otherwordly and exotic masterpiece 'A Dream' along with the playful R&B side 'Hey Now' in long buried sessions from the early 50s. CAMILLE HOWARD "Rock With Me / Nasty Man" 7"
Elmore James "Rollin' and Tumblin' / Stranger Blues" 7"
ELMORE JAMES "Madison Blues / Stormy Monday Blues" 7"
SWEET PEA WALKER "Sweet Pea" 7"
PAUL PERRYMAN "Work To Be Done" / LITTLE BOBBY ROACH "Mush" 7"
JACK McVEA "Wino / Wino" 7"
PAUL GAYTEN "For You My Love / Down Boy" 7"
LITTLE MARGIE "Yes It's You" / BIG BOY GROVES "Another Ticket" 7"
YOUNG JESSIE "Pretty Soon / Well Baby" 7"